The Port Townsend Film Festival will be bringing to the BI Museum of Art “The Cherokee Word for Water” on Friday January 29th at 7pm. From left, Charlie Soap (director of the film, who will attend the BIMA screening) and two of the film’s lead actors. In this podcast, the film is described with personal insights by PTFF Executive Director Janette Force. This full-length feature film is about the extraordinary life and work of Wilma Mankiller, the first woman to lead the Cherokee Nation as its Chief. The inspiring story of how a young woman and mother became a community activist, leader, statesman, and widely respected human rights advocate for the Cherokee Nation, is depicted in this film by producers Kristina Kiehl and Charlie Soap. Charlie is also her surviving husband. Wilma Mankiller, who died of cancer in 2010, being survived by her husband Charlie Soap and two daughters. 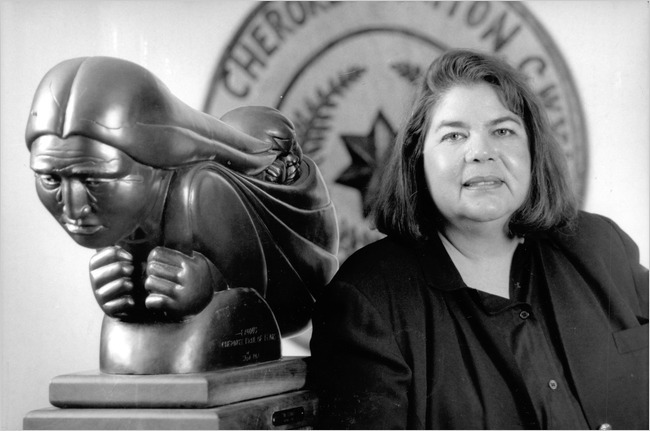 Mankiller is credited with “revitalizing the Cherokee Nation’s tribal government, improving its education, health and housing.” Her administration founded the Cherokee Nation Community Development Department, and by obtaining Federal funding, they were able to complete community development projects including establishing tribally owned businesses, improving infrastructure (most notably, providing running water to the community of Bell, Oklahoma), and building a hydroelectric facility. Her skill as a statesman, as well as community organizer, improved federal-tribal negotiations. In 1998, President Bill Clinton awarded Ms. Mankiller the Presidential Medal of Freedom, this nation’s highest civilian honor. She has also received numerous other awards. The Cherokee Word for Water, tells the story of the Bell waterline project that helped launch Mankiller’s political career, and was also the start of her friendship with her future husband, Charlie Soap, who has seen this film project to completion. The film, produced by Kristina Kiehl in 2013, has screened at the American Indian Film Festival, San Francisco; at the United Nations; the U.S. Capitol; and more than 300 times at colleges, tribal communities and at other venues across the U.S. In 2015, it was voted the top American Indian film of the past 40 years in a survey by the American Indian Film Institute. Producer/director Charlie Soap and producer Kristina Kiehl will both be at the film showing at BIMA to speak and answer questions. Admission is free, but reservations are encouraged, as seating is limited. Read more at the Film Festival site, and reserve free seats at Brown Paper Tickets.